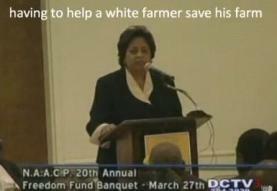 There’s no doubt that last week’s Shirley Sherrod controversy began as a new media story – started by Andrew Breitbart on BigGovernment.com. But there is also no doubt which type of media drove it into the ground – cable news. The story accounted for 33% of the airtime studied, twice as much as the second-biggest story for the sector, the oil spill. During the last half of the week, from July 21-July 25, the story consumed 41% of the cable airtime, quickly overtaking developments in the oil rig disaster and a well-orchestrated rollout of the Washington Post’s series on the nation’s intelligence-gathering bureaucracy. This doesn’t excuse a powerful force in the new media from starting the story, but it does shed more light on how Shirley Sherrod became the media star she has become. While Bob Schieffer knocked new media Sunday, it was the cable news outlets that turned the minor story into a major one. In total, however, Pew found economic issues were the most covered stories of last week. 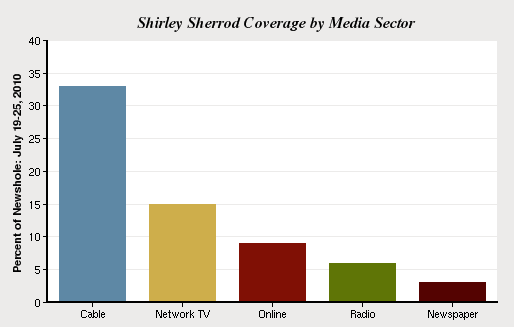 The crisis (“the merits of extending unemployment insurance benefits and Wall Street regulatory reform”) accounted for 17% of all news coverage, while Sherrod was #2 at 14%.